People in the Piedmont Heights area started talking after the News Tribune reported last month about a black Lab taking down a deer in someone’s driveway. Sue Hansen, owner of Hansen’s Auto Service on Trinity Road, said she saw the article and couldn’t wait to speak with customer Andrew Frielund when he came into the store. They assert that a black Labrador retriever is living a wild life in the woods. And that’s only the half of it. The other half is that the canine has formed a relationship with a coyote. “They are well-documented in the area,” Frielund added. Bunter Knowles, who lives on Orange Street near the famed ice volcano, has seen the pair several times in the past few years. In fact, he’s seen them out his window, the coyote sleeping while the Lab stands sentinel. When asked about it Friday, Martha Minchak, Minnesota Department of Natural Resources assistant area wildlife manager in Duluth, said she wasn’t buying it. “There wouldn’t be a Lab and coyote running around together,” she said. And then she saw the photos taken by Steve Owen in 2008. He was able to sneak up on the pair as they were lounging in the backyard of his mother’s house at 2328 Springvale St.
She also said it was possible for the two to breed. Owen said Friday he knows the Lab is alive and well because he last saw it on Monday. Owen said he doesn’t believe the Lab has a human home to visit. With an abundance of deer in the city, Minchak also speculated that the dog was on its own — except for the coyote. “It’s more like the Lab has gone over to the coyote side,” she said. No one interviewed said they’d experienced any aggressive behavior from either animal, and Duluth animal control officer Carrie Lane said no one has ever reported the animals to her office, whether as a nuisance or a curiousity. Knowles said he’s been out in the woods nearly every day snowshoeing and although he thinks he hears the Lab bark at his dog, they never approach him. “Before I would have said (the two together are) something from Walt Disney movies, but now I guess I’d say it’s a classic odd-couple pairing,” she said. She said she’d leave them alone because she didn’t think anyone would be able to rehabilitate the dog. 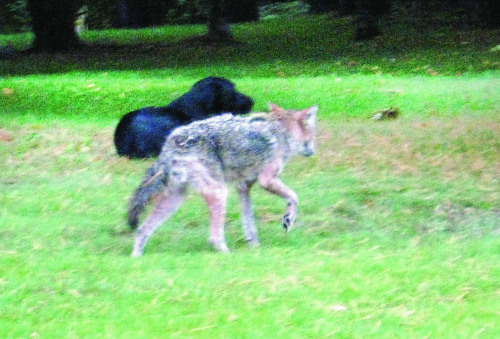 So there we have it: A Labrador has gone feral and has formed a partnership with a coyote. And the two are successfully hunting deer in Minnesota. I think this story puts another hole in some of Raymond Coppinger’s theories, most notably his theory that domestic dogs cannot learn to become successful predators of large game. Coyotes are not major predators of deer. They normally aren’t big enough to really take on the large one. But if a dog the size of a Labrador learned how to hunt a deer, it could provide the muscle that the duo needs to tackle larger prey. The reason why most stray and free roaming dogs don’t become successful predators is that they have no reason to learn how to do so. It is much easier to scavenge off of our waste. It has nothing to do with neoteny or perceived developmental delays. It’s just easier to live as a scavenger. For whatever reason, the Lab has chosen to hunt. Perhaps this dog had a very hard life early on, and it has no reason to trust people. And the coyote just found a partner that isn’t super aggressive. Coyotes are more aggressive with each other than dogs and wolves are, and if a coyote could hook up with a relatively docile breed of domestic dog, it would have the ideal companion. This story reminds me of The Plague Dogs by Richard Adams in which two dogs– a fox terrier and Labrador cross– escape from research facility in England’s Lake District. A fox called “The Tod” teaches the dogs how to be predators in that wild part of England. All dogs are born with some hunting instincts and predatory motor patterns. The only thing humans do is refine them through context and training. That’s exactly what happened here. The Labrador’s learned to use its instincts and motor patterns to kill deer. But par of Coppinger’s theory is that specialized working breeds– like retrievers– can never engage in a full predatory sequence. Their brains are so wired that they cannot stop doing the exaggerated retrieving motor pattern, and thus, they cannot learn to hunt and kill prey. This story shows that to be a very tenuous assessment at the very least. Most dogs can become fully wild again. They just need the context. So, (which seems to be the new word to start any discussion or answer to a question these days) somebody had a lab that either ran away or was dumped by its owner. Somehow it teamed up with a coyote and this pair is surviving. Interesting. A feral dog that can hunt on its own or in a pack often ends up dead. It certainly isn’t one of those inane survivor movies of a lost dog on that impossible journey back home. Mayby the the Lab met the coyote when she was coming to heat? And then they naturally started to hang together. Hope people will get that rear couple as an intresting study and not the n:o 1 environmental disaster to be shot and destroyed.